Details are now available for Festival 2013! 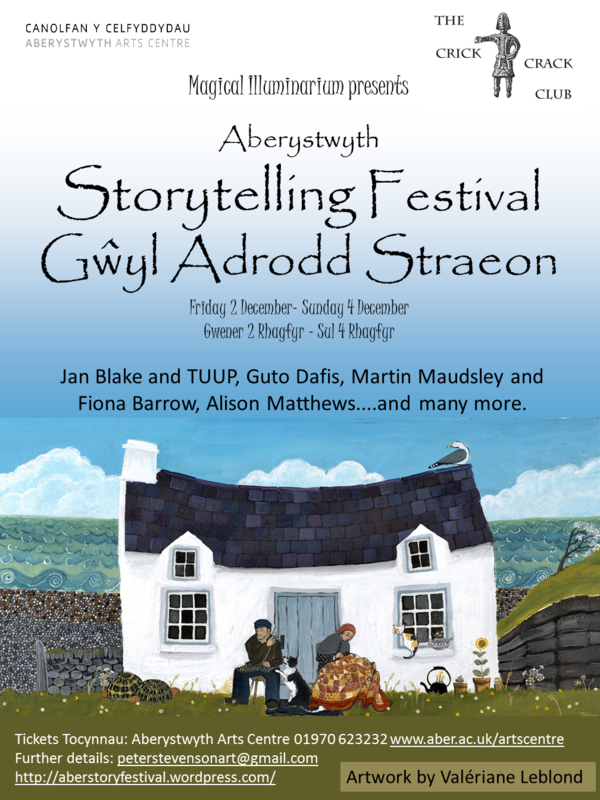 We are thrilled to bring you details of our third annual Aberystwyth Storytelling Festival, which will run from 6-8th December 2013 in the Aberystwyth Arts Centre. The programme is now available by clicking the links above, and the posters can be downloaded below. Welcome to the very first Aberystwyth Storytelling Festival! Storytelling, whether tales told simply around an open fire beneath a crescent moon, or performed in theatres under the glare of arc lights , or stories made up as children drift into dreamworld, is as important in our lives as it has ever been. Stories connect us to our roots, our communities and in an age of uncertainty allow us to give thought to our futures. The Magical Illuminarium and Aberystwyth Arts Centre are bringing together storytellers from around the world for a weekend of tales to tickle the toes and stories to seduce the senses, for the very first storytelling festival in this salty little seaside town. See the Programme and Performers tabs for detailed information. Booking info has also been posted. Note that the contact email in the website and poster below has been updated.